This book further cements Amanda Lotz’s place as a considerate yet comprehensive expert on media and gender studies. It’s often said that “men rule the world”, yet in the world of pop culture scholarship, it seems like just about every other subsection of society receives more analysis. I don’t mean to imply that such speculation is unwarranted or unfair, though; after all, the media tends to portray everyone with offensive stereotypes and generalizations, so we should always try to right these perpetual wrongs. Still, it’s easy to see how the controversies over “manliness” are often ignored these days. 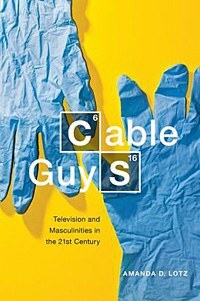 Fortunately, Amanda D. Lotz sheds a lot of light on the subject in Cable Guys: Television and Masculinities in the 21st Century, a thoroughly fascinating and all-encompassing look into how television portrays men today. Although its language and exposition can be too tedious at times, its arguments, information, and variety make it an invaluable work in the field of media and gender studies. An Associate Professor of Communication Studies at the University of Michigan, Lotz has been heavily involved in her field for many years, having previously published The Television Will Be Revolutionized and Redesigning Women: Television after the Network Era, among other works. Her primary focus in Cable Guys is to examine modern day “male-centered serials” and dissect how they approach the struggles, expectations, and messages of their protagonists, including the nature of “feminist approaches to fatherhood and marriage with more traditional constructions of masculine identity that emphasize men’s role as providers.” She covers plenty of popular programming, including Entourage, Men of a Certain Age,Scrubs, Rescue Me, and of course, Breaking Bad, offering unique and thoughtful insight into the messages behind the dynamics within. Expectedly, Lotz begins the book with a lengthy introduction in which she establishes the context, rationale, and worth of her findings. She says, “At the beginning of the twenty-first century, it was impossible to assert any singular argument about ‘men’ on television—and in truth, television had always offered a range of men and masculinities." Thus, Cable Guys “explores the stories told about men in a multiplicity of scripted series… the delved into the psyches and inner lives of their male characters. These series depict male characters’ feelings and relationships in stories that probe the trials and complexities of contemporary manhood in a manner previously uncommon—if not entirely lacking—for this storytelling medium.” As you can tell, Lotz sets herself up for a weighty and sustained investigation of nearly countless sources; luckily, though, she handles them all with great authority and consideration. Early on, she points out that networks like CBS, FOX, USA, and others offered “very different versions of masculinity” during their primetime block on Monday nights in 2010. For example, although How I Met Your Mother includes a “caricature of a suave and debonair ladies’ man… [who was] renowned for his sexual conquests and love of finely tailored suits” in the form of Barney Stinson (played by Neal Patrick Harris), the show contrasts him with more mature responsible characters, such as Ted and Marshall, to illustrate how ridiculous Barney is. However, Two and a Half Men seems to “side with… and support, rather than critique, the masculinity” of the similarly shameless Charlie Harper (played by Charlie Sheen, who no doubt drew from personal experience for the role). Contrasts like this make Cable Guys so stimulating. As for The Sopranos, it is one of many examples of HBO’s “gender-specific narratives…disproportionately centered on male characters [that] offered intricate examinations of their uncertain negotiation of modern male identity,” like network peers Oz, Six Feet Under, The Wire, Entourage, and Hung. In fact, Lotz claims that the show “provided the template” for many other shows through its “two lessons that changed television creativity,” one of which is that the central character doesn’t have to be a good man. Like many other programs she discusses, The Sopranos,asks viewers to judge if and how immoral actions can ever be vindicated. As usual, she’s spot on with this observation. Walt’s pre-diagnosis sleepwalking through life certainly isn’t venerated, but neither is the egoist that he becomes… As Walt becomes increasingly self-centered during season four, Jesse’s character becomes progressively more central as the hero of the narrative… the series depicts both men looking for meaning in their lives, but where Walt searches for prestige and a sense of accomplishment… Jesse searches for meaning through human connection. A word of warning must be given about Cable Guys, though: it’s written as formally and academically as possible, with plenty of intellectual jargon, intricate syntax, and prolonged claims. It reads more like a doctorate thesis (footnotes and all) than a personable account, so internalizing it can be laboring, to say the least. If that’s not an issue for you (since it’s not inherently negative), no worries; but if you’re looking for something more in the vein of, say, "Male Bashing on TV" by Michael Abernethy (an essay I teach often, by the way), you may be disappointed. I’m not suggesting that Lotz should’ve constructed her book for idiots or lazy readers; I’m just saying that complex ideas don’t necessarily require equally complex written structure, and one runs the risk of alienating and losing readers if his or her prose is too academic jargon-laden to be engaging. All in all, Cable Guys is an incredible work that should further cement Lotz’s place as a considerate yet comprehensive expert on media and gender studies. Her writing, while perhaps too scholarly and extraneous at times, oozes confidence, knowledge, and reflection for her themes and televised tales. I’ve taught a fair amount of comparable criticism over the years from revered authors like bell hooks and Jean Kilbourne, and this book is as good as anything else I’ve come across. As long as you’re interested in the subject matter and are okay (or even happy) with the manner in which Lotz examines it, you’ll cherish Cable Guys.